In mid-2017, the website of an award-winning food stylist was using a Flash website to display images. When an alert came through that Google was having difficulty crawling the site, the food stylist decided to build a new website themselves using a website-building software. During the website relaunch process, the site was switched to a secure version (https from http), but Google was never alerted to this change. The website had consistently appeared at the top of page 1 for “Food Stylist Chicago”, but after the relaunch, it had completely dropped off of page 1 of Google’s results for this critical search term. periscopeUP was retained to help remedy the situation as quickly as possible. As a first step, we configured Google Search Console, and ensured that the https version of the site was verified and that a complete and accurate sitemap was submitted to Google. This change alone moved the site to the bottom of page one for “Food Stylist Chicago”. We then added unique and relevant meta titles, meta descriptions and H1 tags to each page, as well as unique and descriptive alt text for all site images. We reviewed all of the site images and compressed the largest ones in order to improve the page load speed. After approximately two weeks, the new website had moved back up in rankings to the top of page one for “Food Stylist Chicago”. 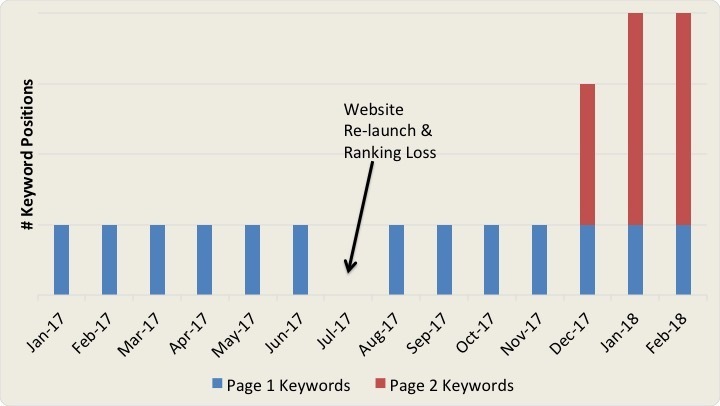 The positive results shown in the graph below illustrate how quickly and effectively technical SEO maintenance services can be in helping a site regain in rankings, as well as positioning the website to enjoy continued ranking growth.